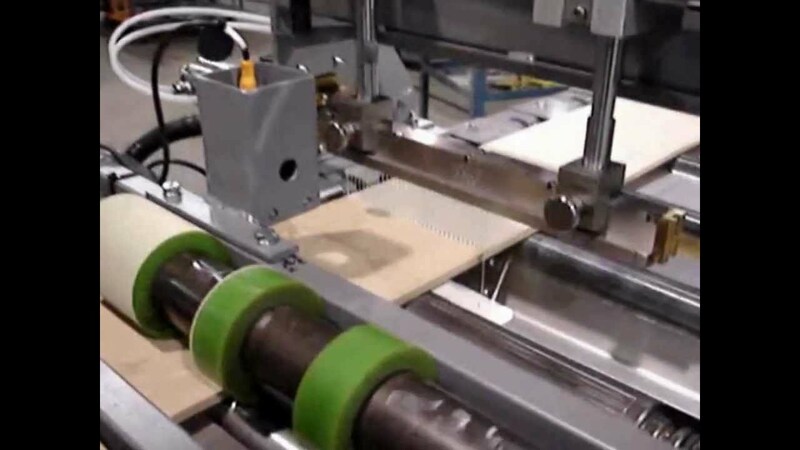 A Sequencer Belt Conveyor allows the operator to stage several parts in its bottom feed reserve to increase productivity by maintaining the flow of material constant through the glue applicator. A Sequencer Belt Conveyor allows the operator to stage several parts in its bottom feed reserve to increase productivity by maintaining the flow of material constant through the glue applicator. Depending on the application, the belt can stop feeding between consecutive parts to create gap or keep a continuous feed of parts. Following the sequencer, each part passes through a series of bottom feed steel rollers and the glue application zone. Each space between rollers is covered with stainless steel plates for easy cleaning. Over the motorized rollers before the gluing zone, there is opposite pressure wheels in order to insure a constant speed of the pieces as it goes through the glue application area. The rollers are powered by an electric motor with variable speed drive up to 60 fpm. The glue zone consists of pressurized applicator head made by Apquip. The glue head spreads multiple glue lines along the piece's top surface with precise quantity. A 12 gallon pressurized stainless glue tank, adjustable mounting brackets and valves are included with the applicator head. When the glued piece reaches a stop fence at the end of the roller conveyor, a sensor stops the feeding cycle until the parts are removed by the operator. Thickness: 1/8" to 1 ¾"
Sequencer reserve capacity: 12" high or a maximum of 150 lb.